Description Of Item: A servant of the Unnamed One, Hssss was chosen to lead an army of Snake Men? to the planet of Eternia� to plunder its magical secrets. He ruled Eternia� for three centuries until a rebellion formed under D?Vann Grayskull. Soon afterwards, the Horde invaded and Hssss was drawn into a three-way war. All three sides agreed to a temporary truce in order to construct the Three Towers, but Hssss was betrayed by Hordak� and in time was banished to the Void by the Elders and Zodak?. 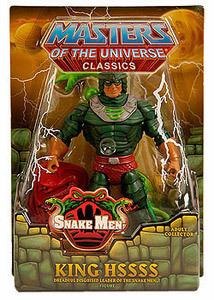 For five centuries he and his army waited until Evil-Lyn� and a Snake Men? descendent named Kobra Khan opened the Snake Pit to free them. King Hssss? often tricks foes by appearing heroic but then transforms into a seething mass of serpents and leads the Snake Men? into battle!